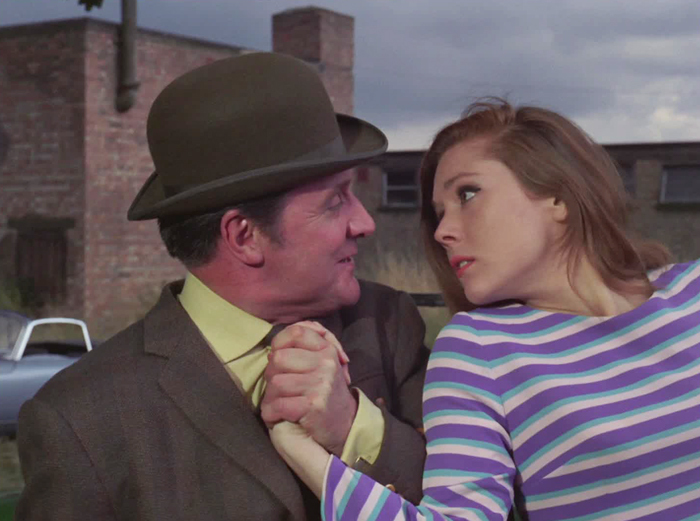 Season Five is arguably The Avengers season where the show achieved its greatest visibility – now in full colour, Patrick Macnee and Diana Rigg returning as its most formidable partnership – but also one that experienced a slight slip in quality from what is rightly regarded as the previous year's pinnacle. There’s little in the way of outright turkeys here – it has that much in common with Season Four – but fewer outright gems too. Brodny! That wacky Russian, he’s so funny. No, not really, although there's no denying Warren Mitchell's chemistry with Macnee. The invisibility plotline, in a season divided between actual science-fiction premises and fake-out ones, fits comfortably into the latter. Whereas this one, with Michael Latimer painted green and electrocuting people, appeals to the former. A bit dull, despite some cartoonishly victim-shaped impact craters. 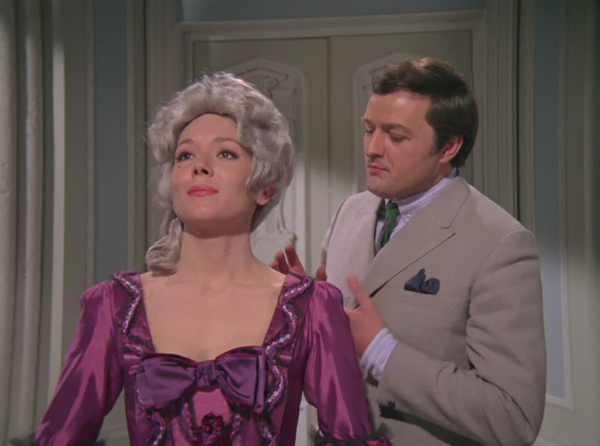 Redundant remake of Season Two's Death of a Great Dane, most notable for a cameo by Anneke "Polly" Wills (Dressed to Kill). 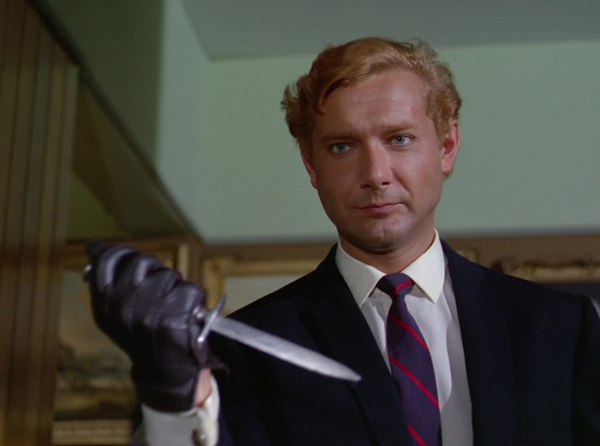 Patrick Cargill's cool shades and minimalist office space only go so far in making up for a fairly standard murder-for-hire yarn. 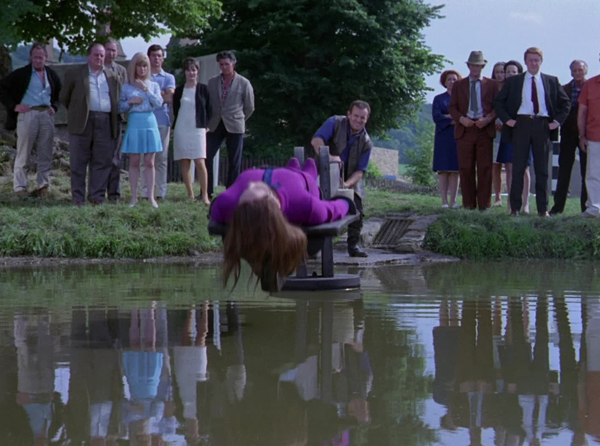 Peter Bowles is a winner, as is the time-tunnel effect, but you know this is a scam almost from the first, which makes much of the proceedings feel like they're treading water. 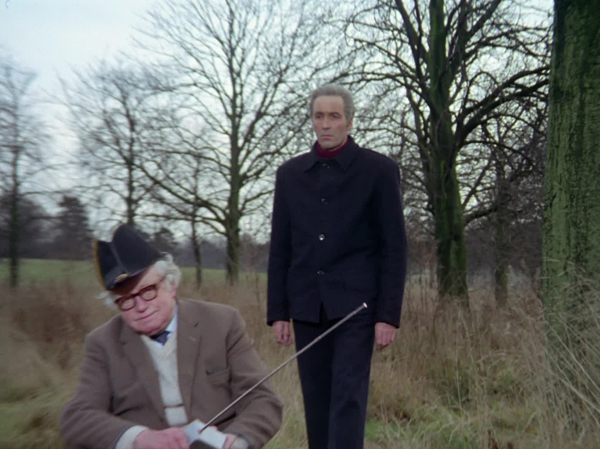 About as sci-fi as the show gets, with several Christopher Lees running around and a plot that's pretty much a robot version of Invasion of the Body Snatchers. It's all rather dry, unfortunately, and double the Lee would only pay off if he were well used. 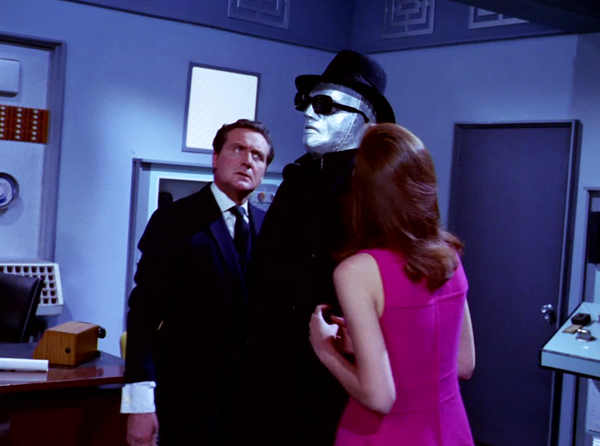 Another remake, of Don't Look Behind You this time, benefiting from strong production design and the commanding presences of Ronald Lacey and Peter Jeffrey, but it’s a story – Avengers girl in peril in an empty house – that has been overdone already prior to this instalment (and it won’t be the last of them). 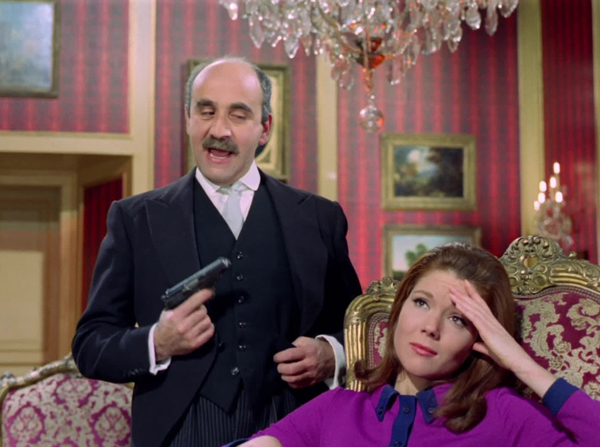 The second sequel of the season (if you count Brodny's return as the first) with Peter Cushing's stock villain out for revenge and wooing Mrs Peel. It's more engaging than the original, but that's still not quite enough. 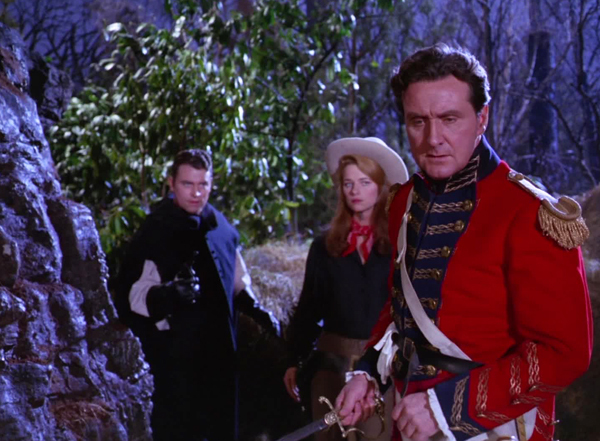 Reasonably diverting spy fare in which Ron Moody's parrot passes secrets to the enemy. 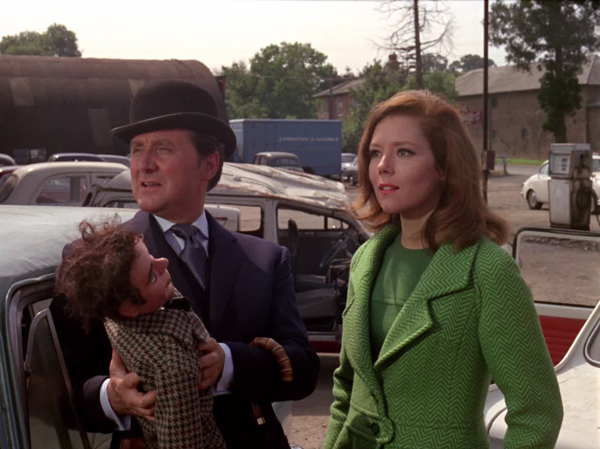 Emma and Steed pose for Kenneth Cope while a couple of vicious killers add an unpleasant streak. Like much of the season, you get the feeling other episodes have done this better. 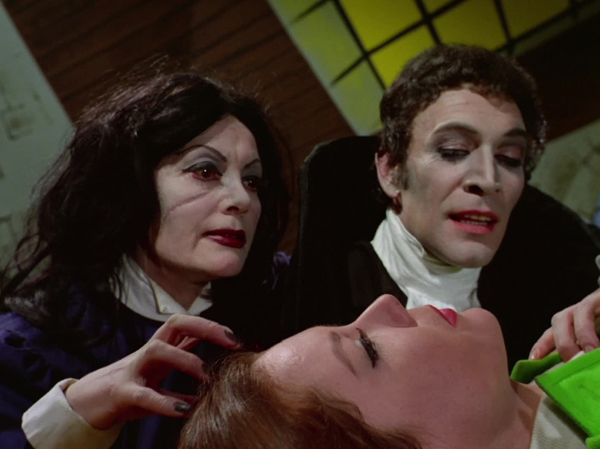 A remake of The Charmers, and I'm not being a purist by rating the originals as superior to the Season Four versions in each case (particularly since I first saw this season long before the Cathy Gale episodes); the school for killers is a serviceable idea, but the positives of Philip Madoc and Anna Quayle (Olga from the Volga) have to be balanced against the disappointments of Michael Gough and Terence Alexander. 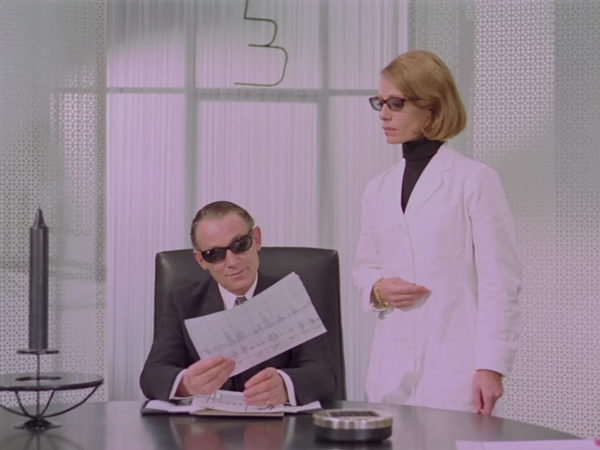 Steed gets shrunk, Emma gets shrunk, and an over-sized desktop set gets a good work out. 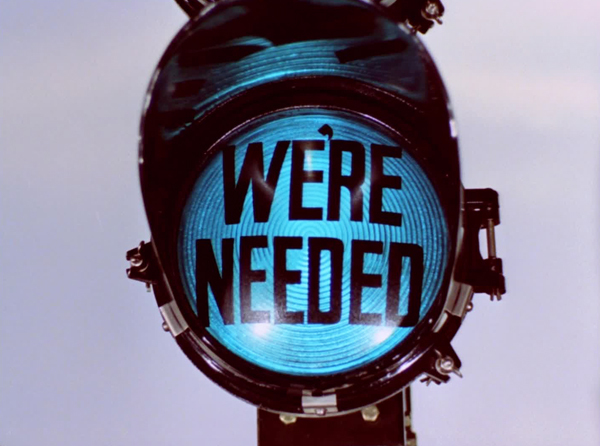 For all the conscious absurdity of the premise, it probably doesn’t revel in its potential for silliness quite enough. 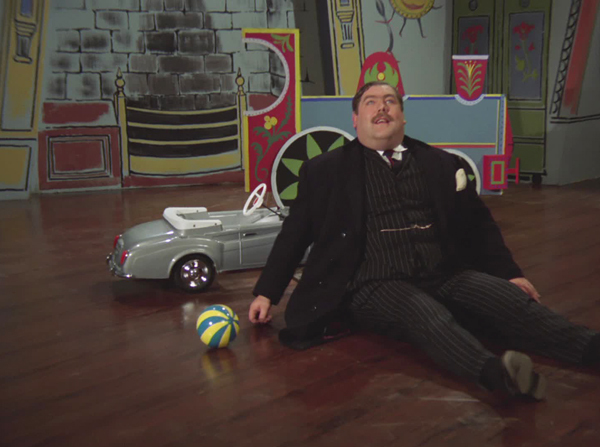 The villain, meanwhile, has a disturbingly offhand manner in disposing of his miniaturised victims. A rarity in that the gag title premise doesn’t wear thin, as Simon Oates repeatedly doesn't kill his bribery victims (until he does). 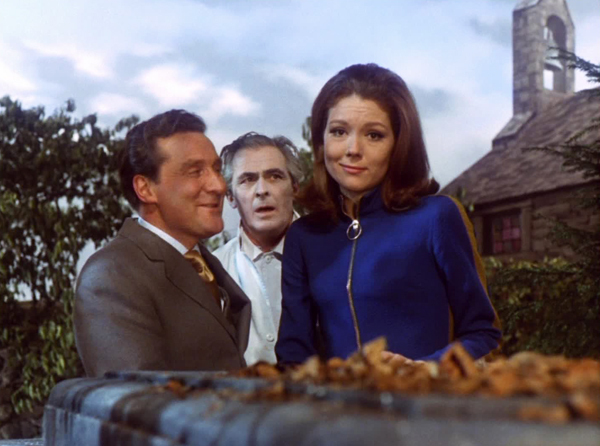 Also present and correct: various attempts at double crosses, Mrs Peel getting some quality riverside action, and a villain who lives in a haystack. 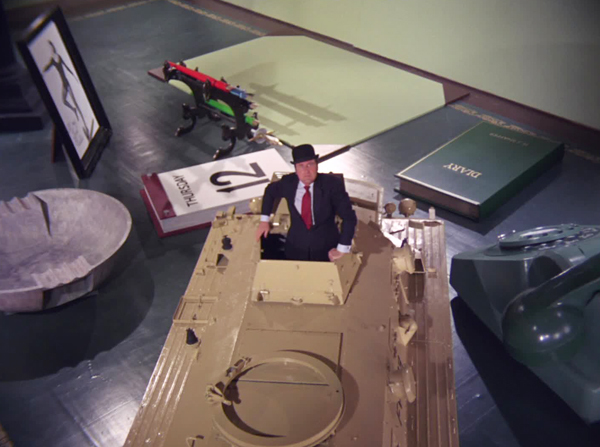 One of the season's fake SF/fantasy episodes, although the Bond villain plot to take over the country via an army beneath a sleepy rural town, complete with Julian Glover in a Fahrenheit 451 hat, goes some way to compensate for the absence of actual ghosts. Particularly notable for an extreme burst of ultra-violence on Emma's part. Effectively trippy dream sequences (those faceless reporters) supporting an intriguing if ultimately implausible how-did-they-do-that, all in aid of an attempt to confound a European peace conference (imagine that). 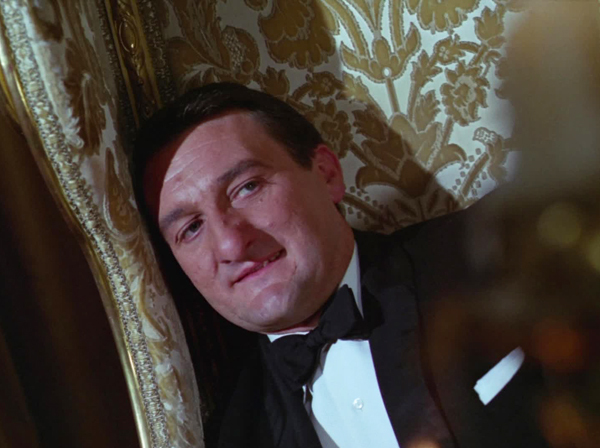 Includes a tense scene where Steed ends up as target practice. That would be Sidney Havers directing again. More messing with subjective reality for devious ends, as politicians are reduced to infantile states in order to persuade them to offer up secrets. Particularly unnerving amidst the regressed adults is Dudley Foster's Nanny Roberts. 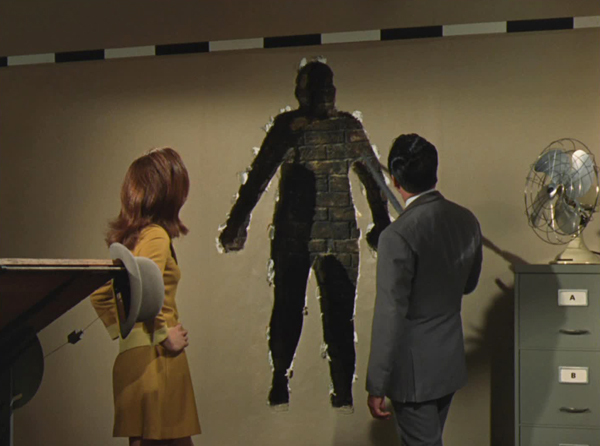 Space visitors killing members of the British Venusian Society? A bright selection of supporting players (Jon Pertwee, Jeremy Lloyd's chimney sweep Bert Smith - "Actually, it's Bertram Fortescue Winthrop Smyth. To be absolutely accurate") and a mastermind whose identity isn't unveiled until quite late in the game add to the appeal. 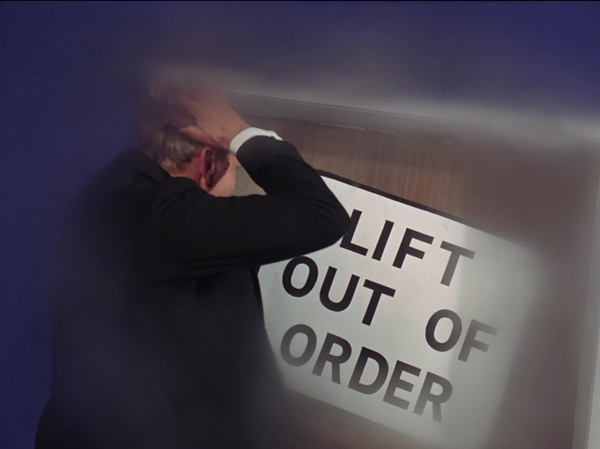 Emma under pressure and Brian Clemens working with what's on hand at Elstree result in a mostly inspired riff on the motion picture business as Jason Wyngarde takes full advantage of the opportunity to devour scenery at every turn. 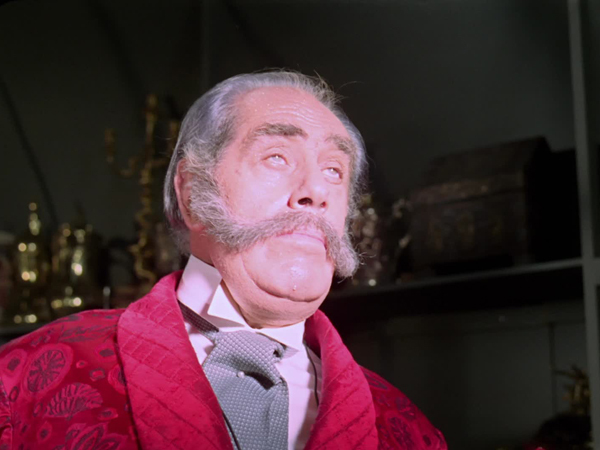 Body swap tales can be a desperate fall-back option for creatively bereft staff, but this one's largely a success thanks to the performances of Freddie Jones and Patricia Haines. 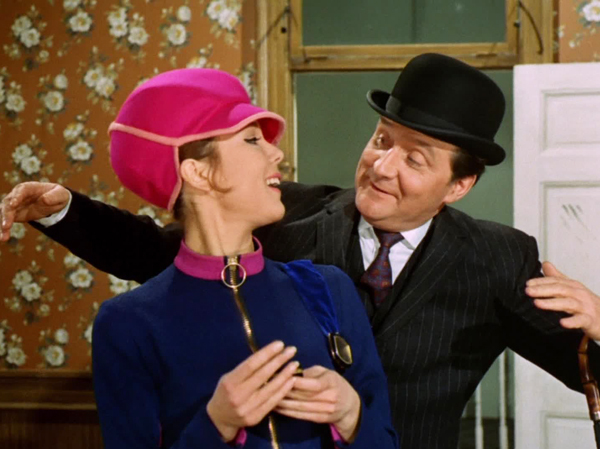 Only Macnee as Jones doesn’t quite convince. 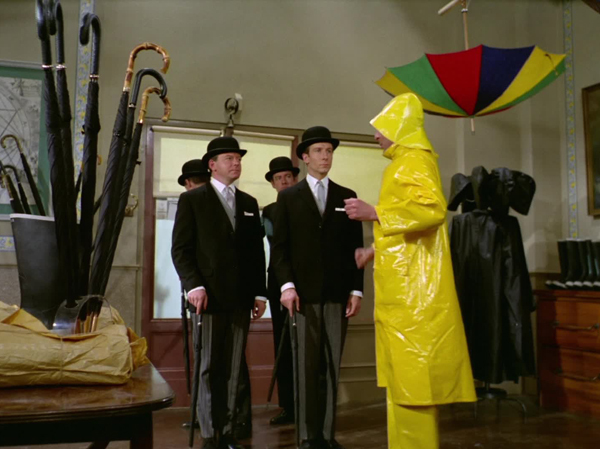 The familiar Agatha Christie (and Dressed to Kill) structure can't diminish this one, thanks to a colourful supporting cast (Brian Blessed, Donald Sutherland, Charlotte Rampling, John Hollis) and an effective reinvention of the story, rather than the kind of straight retelling that has dampened other remakes this season. 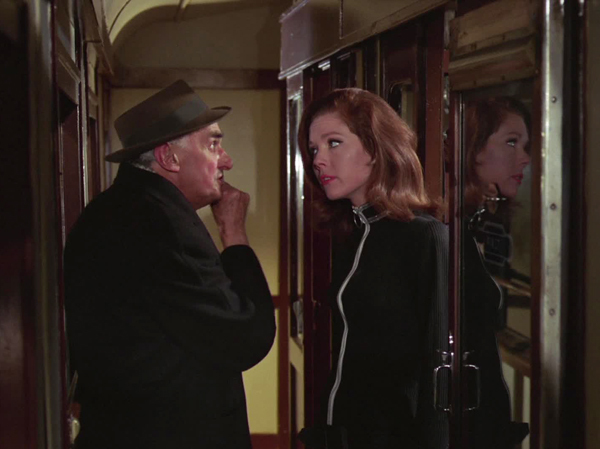 Always welcome Avengers guest star John Laurie steals the show as a railway enthusiast, but this episode chugs along very pleasingly on all accounts; particularly winning are the exchanges between a captive Steed and James Hayer's Ticket Inspector. A visit to Little Storping In-the Swuff finds Emma at the mercy of a murderous free-for-all, with a particularly unpleasant Colin Blakely. Indeed, if not for his lack of comeuppance – a pie in the face hardly counts – this would have full marks. An infectiously frivolous, summery jaunt as a Laurie Johnson provides an indelible musical accompaniment to a race round the countryside. 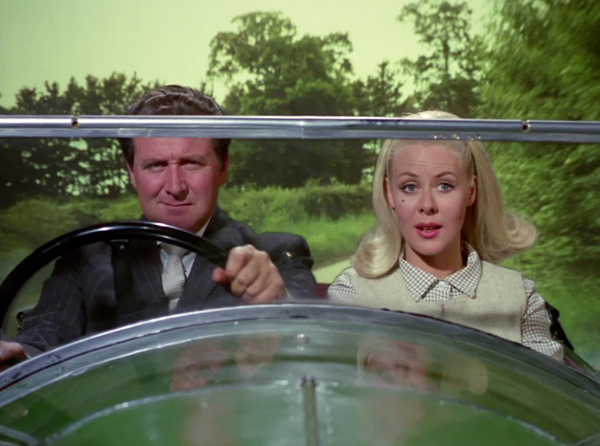 Emma and Steed and are mixed and matched with guest co-drivers as dirty tricks abound. 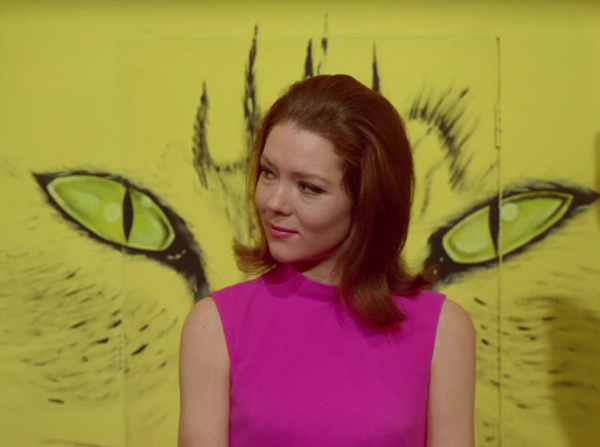 Reeks of effortless '60s cool.